On January 10, 2017, Tiffany was driving with her baby in the back seat. Since she saw a red light at the intersection of Main Street and Tony Galento Plaza in New Jersey, Tiffany slowed down and stopped accordingly. While waiting for the light to turn green, the vehicle behind her failed to slow down and rear-ended Tiffany’s car. After the accident, Tiffany was able to drive herself and her baby to East Orange Hospital. After medical examinations, Tiffany and her baby were discharged from the hospital. Thankfully, Tiffany’s baby was completely fine. Unfortunately, Tiffany continued having severe pain in her neck and back since the accident. She experienced intermittent tingling in her left arm and hand. Tiffany also felt an aching pain throughout her lower back that would transition into a stabbing pain whenever she moved. As a result of her injuries, Tiffany missed several days of work and had difficulty holding her own child. For years, Tiffany’s mother listened to Adam Handler over the radio. When Tiffany’s mother found out that her daughter was in a car accident, she recommended her daughter to The Case Handler. Thank you Tiffany’s mom! Our team helped Tiffany locate a convenient location to receive therapy treatment and ensured that all of the treatment she received was paid for. 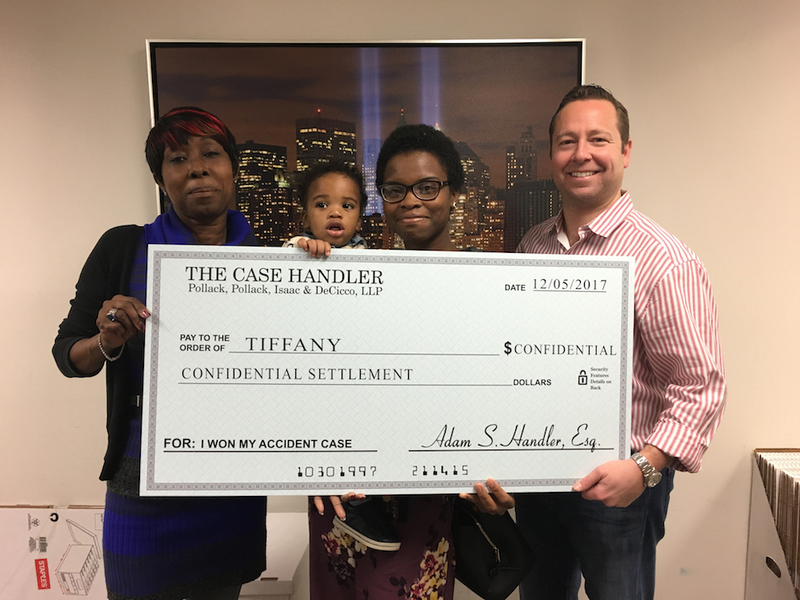 Just 9 months later, The Case Handler settled Tiffany’s case, paid for all of her medical bills, and handed her a big settlement check…that is TAX-FREE! Congratulations Tiffany! As a parent myself (and I’m sure all parents can relate), the thought of getting into an accident with my children in the back seat is a scary thought…especially when it’s a rear-end accident! We are so thankful that Tiffany’s baby was fine…but everyone injured in an accident is someone’s child. We are honored that Tiffany’s mother entrusted The Case Handler team to help her child and we are also here for your loved one if they are hurt in a rear end accident.